Looking for the best place to spend St. Patrick’s Day this year? If you live in or around Chicago, you are in luck. Chicago has continuously been voted one of the top places in the entire United States to celebrate the beloved St. Patrick’s Day and share in over the top festivities. So although anywhere IN Chicago would probably be ok, you really should check out the St Patrick’s Day celebration at Irish Nobleman Pub Chicago 2018. Keep reading to find out why. Trips to Discover put Chicago in the number 3 spot in a recent article titled “Top 15 cities to celebrate St. Patrick’s Day in America.” I mean, c’mon people- we here in Chicago dye our actual RIVER GREEN! How many other places can say they have approximately half a million people show up to celebrate St. Patrick’s Day by intentionally dying a river that runs through their city… GREEN? Travel and Leisure even reported that Chicago has more celebrations and parties for St. Patrick’s Day per capita than anywhere else. Obviously one of the best places in Chicago to celebrate- the traditional Chicago Irish Pub. 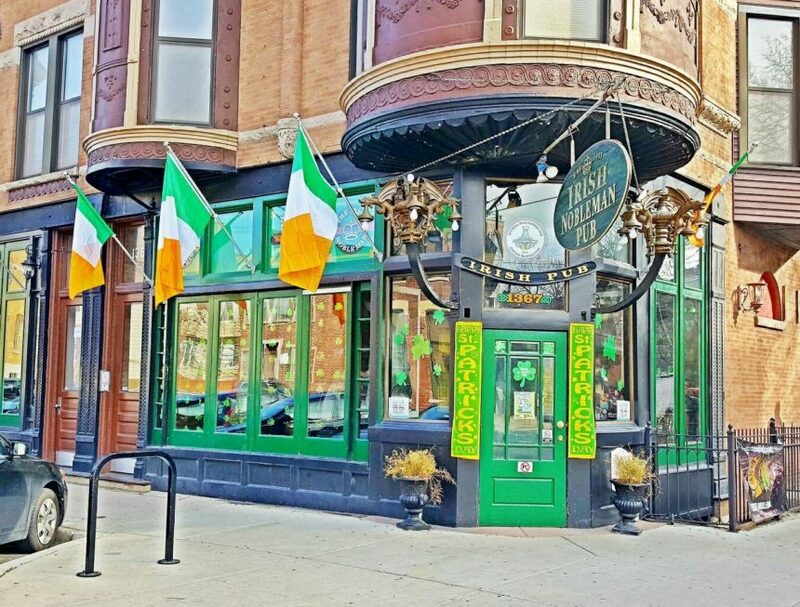 Although everyday has authentic Irish influence at Irish Nobleman Pub and a handful of other legit Irish owned joints in Chicago, celebrating the big day in an actual Irish Pub is really the way to go. Here’s the run down for the St Patrick’s Day celebration at Irish Nobleman Pub in Chicago for 2018. Saturday March 17th, we’ll be opening at 9am so we can get a full day of celebrations! Kitchen will open at 10am, and of course we’ll have 0ur near famous slow simmered corned beef brisket with cabbage & potatoes. Additionally, we’ll be serving up our crispy reuben rolls with the fan favorite house-made thousand island. The regular menu will be running for part of the day, and then a limited menu will go into effect to keep kitchen and food service wait times down once things really start filling up. A variety of Irish music and favorite hits will be playing through the day & evening, with Irish entertainment of bag pipe players starting at 7:30pm. We hope to celebrate St. Patrick’s Day with you at Irish Nobleman Pub, but wherever your day takes you- please remember to be responsible and stay safe. We’re always happy to call you a cab, and please remember never drink and drive. Debate for the masses…. Is it “St. Patty’s Day” or “St. Paddy’s Day”? Follow Irish Nobleman Pub on facebook to chime in and follow the debate.